Our Lady Help Of Christians Praesidium, Boherlahan-Dualla. OF THE LEGION OF MARY, BOHERLAHAN - DUALLA. Frank Duff, the founder of the Legion of Mary was born in Dublin on the 7th June 1889. He was the eldest of 7 children and on completing his education at Blackrock College he worked in the Civil Service. At the age of 24 he joined the Society of St. Vincent de Paul where he was led to a deeper Commitment to his Catholic Faith through serving the needs of the poor and underprivileged. As time went by, in serving the physical needs of the people, he was inspired to go a step further, serving their spiritual needs by founding the Legion of Mary. On the 7th September 1921, the eve of Our Lady’s birthday he founded the first Praesidium entitled “Our Lady of Mercy” at Myra House, Francis St, Dublin. From that date until his death on the 7th November 1980 he guided the world wide extension of the Legion which now stands at 4 million active Legionaries together with above 10 million Auxiliary Members. Down through the years several Popes have given the Legion their blessing and the Legion of Mary is certainly connected with Pope Francis’ Vision for the Church to-day towards the new Evangelisation. 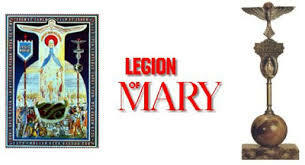 The Legion of Mary is built upon devotion to Mary. It is a worldwide lay Catholic organisation. Its headquarters is in Dublin. A branch in a Parish is called a Praesidium and each Praesidium is named after a title of Our Blessed Lady. Legionaries attend a weekly meeting to recite Legionary Prayers and arrange to do active work. Our local branch of the Legion of Mary, in the Parish of Boherlahan-Dualla is called ‘Our Lady Help of Christians Praesidium’. It has been active in the Parish for the past 13 years. Our members attend the weekly meeting to pray the Legionary Prayers, arrange for active work and discuss matters that arise at the meeting. Members do active work such as Nursing Home visitation, filling holy water bottles, and home visitation where the Fatima Statue is brought to families as a help to promote the Fatima message. Other active work that some members do is participating in the ‘Maria Et Patria’ (MEP) Project in various parishes in Ireland. Recently members have visited Cobh, Fermoy, Mitchelstown, Thurles, Kinsale, Waterford and Killarney. One member has also participated in the ‘Peregrinatio’ Project in Scotland & England. Details of these projects will be included in future bulletins. At present, we have active and auxiliary members in our Praesidium. New members are invited to come and visit the local branch. Or, if not available for active membership, to consider auxiliary (praying) membership.